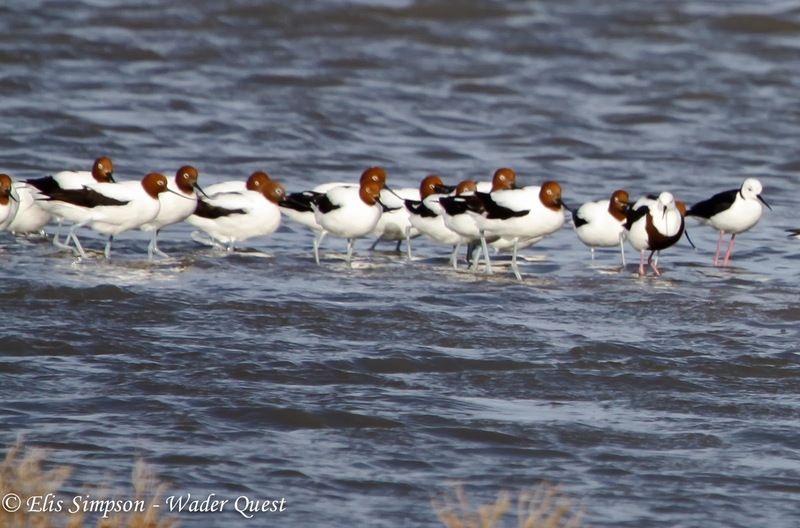 Wader Quest: Recurvirostridae, avocets and stilts; what a beautiful family! 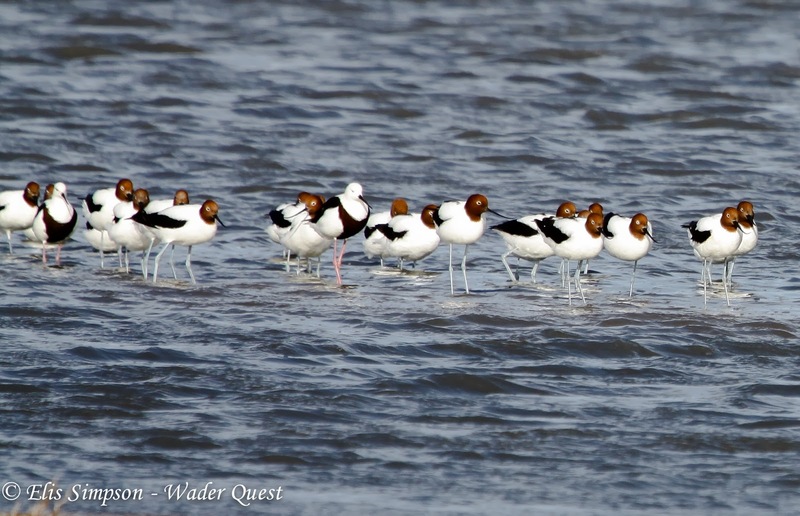 Recurvirostridae, avocets and stilts; what a beautiful family! 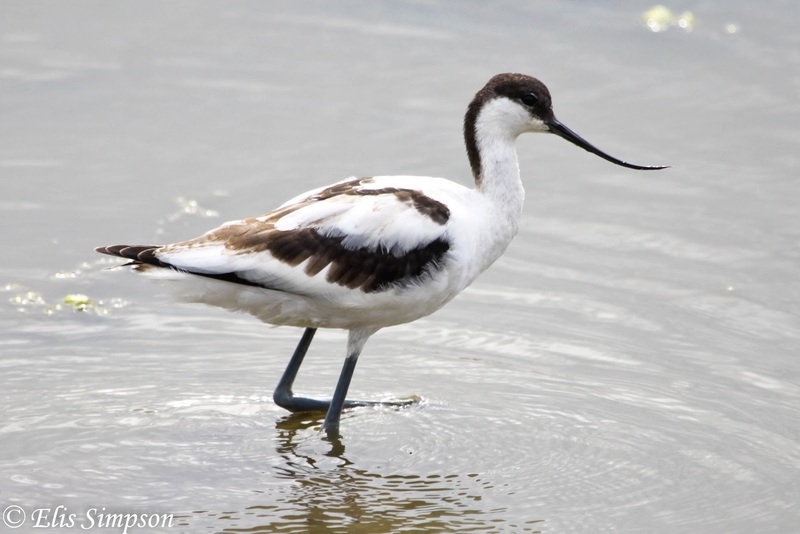 Pied Avocets are probably one of the most popular waders in the UK, they are easy to identify, suitably uncommon to be interesting and of course they are the great come-back story among our native birds and immortalised as the RSPB symbol. Pied Avocet Recurvirostra avosetta; adult, Snettisham RSPB, Norfolk, England. Pied Avocet Recurvirostra avosetta; juvenile. Titchwell RSPB, Norfolk, England. Same bird as above but showing the characteristic feeding action, sweeping the curved bill through the water. Adult Pied Avocet showing the striking wing pattern in flight. Martin Mere WWT, Lancashire, England. Adult Pied Avocet feeding. Titchwell RSPB, Norfolk, England. A group of Pied Avocets resting and feeding. Cley NNT, Norfolk, England. Pied Avocets can be very aggressive towards other species, here one is chasing off a duck that got too close for comfort. This bord was observed chasing this duck for some time, even jumping on its back at one stage. Titchwell RSPB, Norfolk, England. 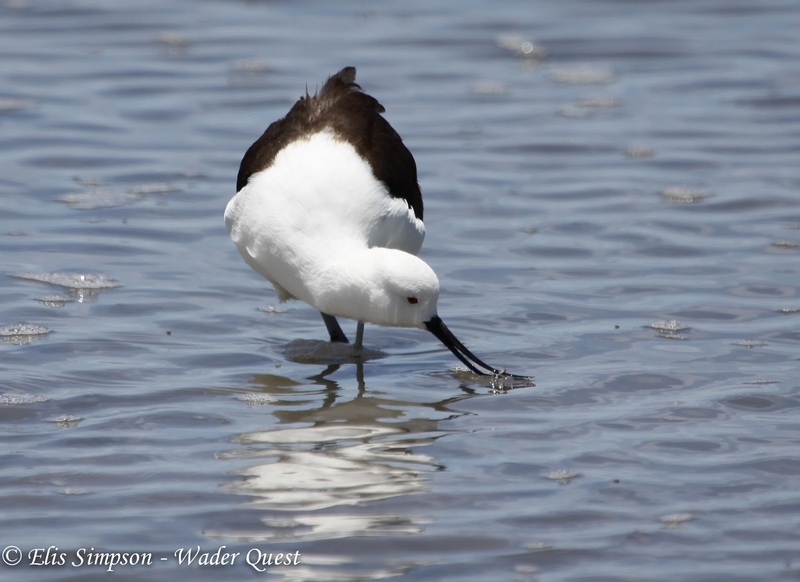 Avocets will swim like most waders if the water is too deep to wade. This one is a captive bird at WWT Slimbridge. 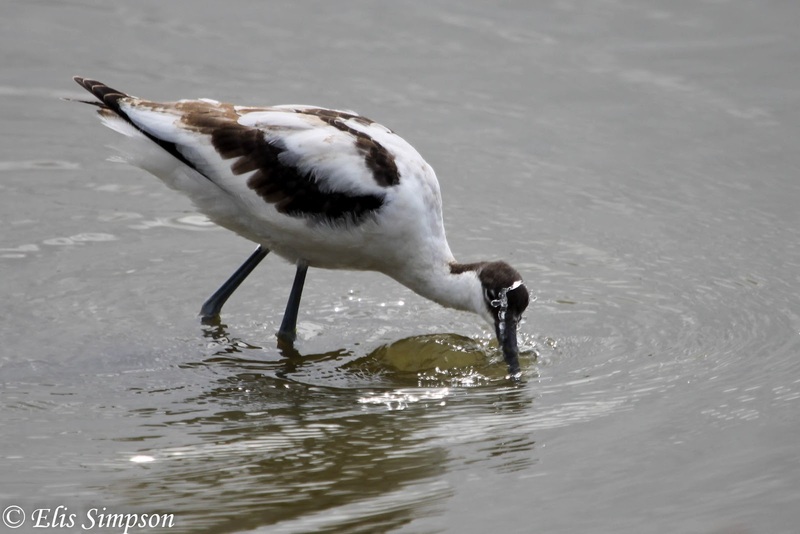 All avocets have delicate and up-curved bills, the angle and degree of curvature varies between species and even between the sexes in American Avocet where the female has a shorter more curved bill than the male. 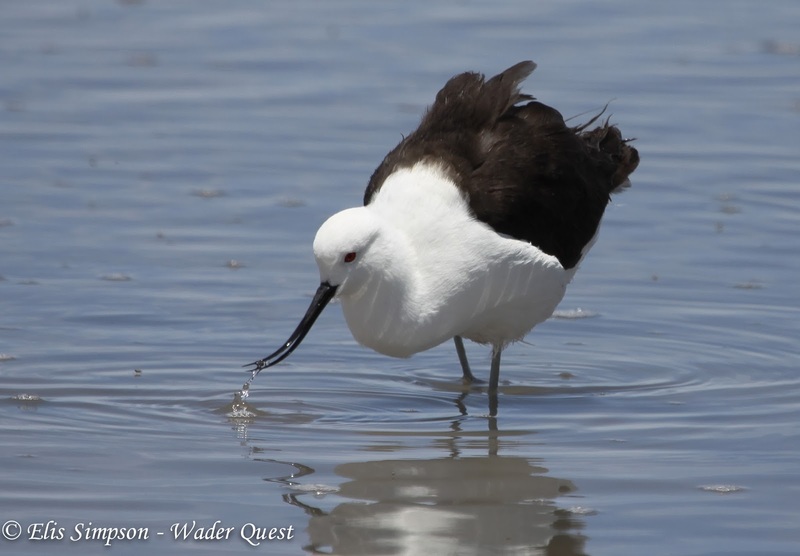 All the species are predominently black and white but only the Andean Avocet has an all black back. This species lives at high altitudes exclusively in the Andes of South America, and although you can't see it in these photographs it has a deep red eye colour. Andean Avocet Recurvirostra andina; Adult bird, Laguna Chaxa, Región de Antofagasta, Chile. Adult Andean Avocet feeding using the characteristic sweeping motion typical of avocets. Laguna Chaxa, Región de Antofagasta, Chile. 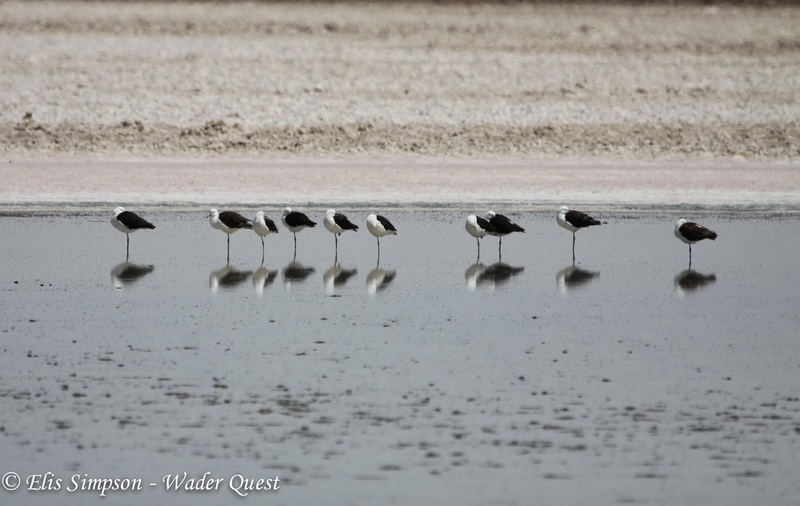 A group of Andean Avocets asleep, looking very much like stilts. Laguna Chaxa, Región de Antofagasta, Chile. The American and Red-necked have coloured heads, orange and chestnut respectively. The Red-necked however is alone in keeping its colour all year, the American Avocet changes from orange to grey in winter. American Avocets Recurvirostra americana; These birds are showing a variety of plumages from the grey-headed non-breeding plumage through to full orange-coloured breeding plumage. Galveston Island Texas, USA. Non breeding adult, LA River, Palm Beach, California, USA. Adult. Galveston Island, Texas, USA. Red-necked Avocets Recurvirostra navaehollandiae; Werribee, Victoria, Australia. A slightly closer view with two Banded Stilts Cladorhynchus leucophalus; Werribee, Victoria, Australia. That brings us onto the stilts. The first of these has a genus of its own, it seems to fit between the avocets and true stilts and bears the same scientific specific name as the White-headed Stilts of Australasia, leucocephalus, meaning just that, white-headed. They are bulkier and shorter necked than the stilts but have the pinkish legs in common with them, but their bill is often slightly up-curved like the avocets. 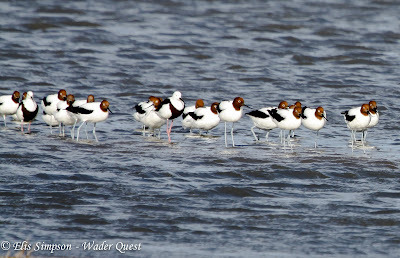 Red-headed Avocets, Banded Stilt (2nd fro R) and Pied Stilts Himantopus leucocephalus (R); Werribee, Victoria, Australia. 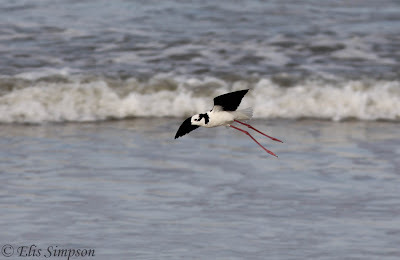 Banded Stilts. ; Rottnest Island, Perth, Western Australia, Australia. When considering the rest of the stilts taxonomy becomes an issue, we have tended in Wader Quest to be splitters rather than lumpers, this is in no way a scientific judgement on our part, merely a suitable way of recording what we have seen more easily, so, instead of there being just two himantopus stilt species in the world, Black and Black-winged, we recognise five, the Black winged being split into four with White-headed in Australasia, Black-necked in the Americas down to northern South America (including the hawaiian race) and White-backed south of that range. 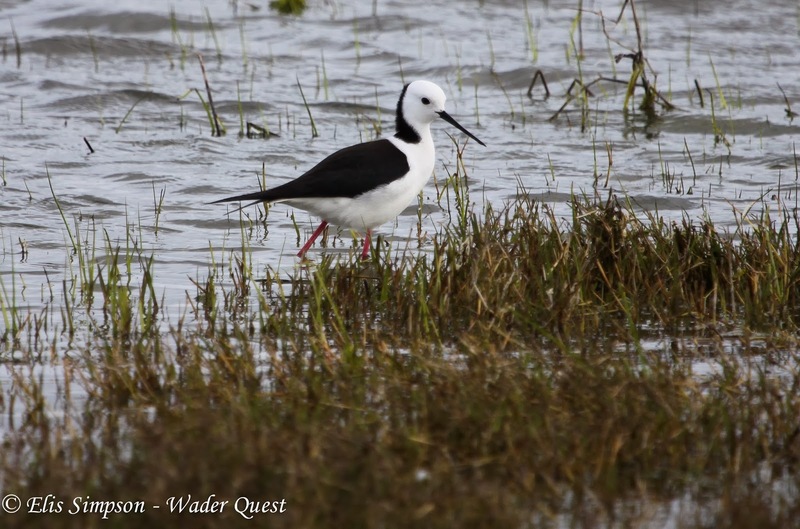 The familiar stilt to us in Europe is the Black-winged Stilt which has a range that stretches across to Asia. Adult Black-winged Stilts have no black on their head and neck at all. Balck-winged Stilt Himantopus himantopus; Pak Thale, Phetchaburi, Thailand. Juvenile Black-winged Stilts show a smudgy grey crown and neck which fades with age. 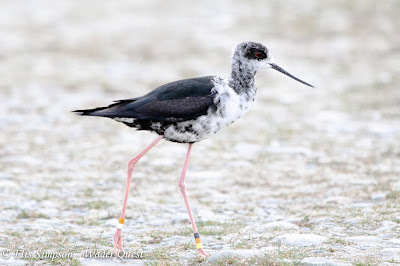 In the americas there are two species or forms, in the north spreading from the USA where it is largely a summer visitor down to northern South America about half way down Brazil is the Black-necked Stilt. This species shows a black cap with a white flash above the eye contiguous with the hindneck which then merges into the black back. Black-necked Stilt adults. Salton Sea, California, USA. 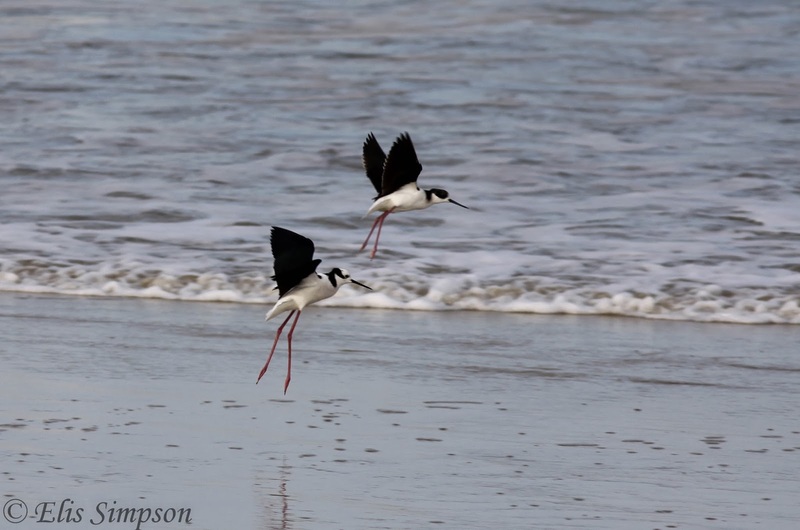 In Southern Brazil, across to the Pacific and south the stilts are White-backed Stilts. They are distinguished from the Black-necked by not having a black crown, but the black from the hind neck extends to the eye in a thin stripe and is seperated from the lower back by a complete broad white bar across the shoulders. White-backed Stilt Himantopus melanurus; Adult bird showing the white shoulders and crown. Tavares, Rio Grande do Sul, Brazil. Same bird as above in flight. Confusing the matter a little is the fact that these last two species do hybridise in their zone of overlap. In Minas Gerais we came across a family of birds where the adults were White-backed and Black-necked and the offspring were a mixture of the two. Adult Black-necked Stilt. Pirapora, Minas Gerais, Brazil. Adult White-backed Stilt paired with the above individual. Pirapora, Minas Gerais, Brazil. Hybrid Black-necked/White-backed Stilt offspring number one. Does not show the white shoulder bar, but the dark juvenile crown is giving way to the white crown of the White-backed Stilt. Hybrid Black-necked/White-backed Stilt offspring number two. Shows the white shoulder bar of White-backed, but retains the dark crown and white flash over the eye of Black-necked Stilt. 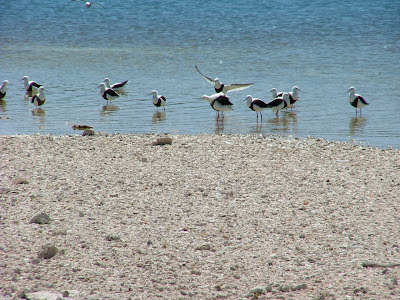 Moving across to Australasia, the stilt there is called White-headed Stilt or sometime Pied Stilt. 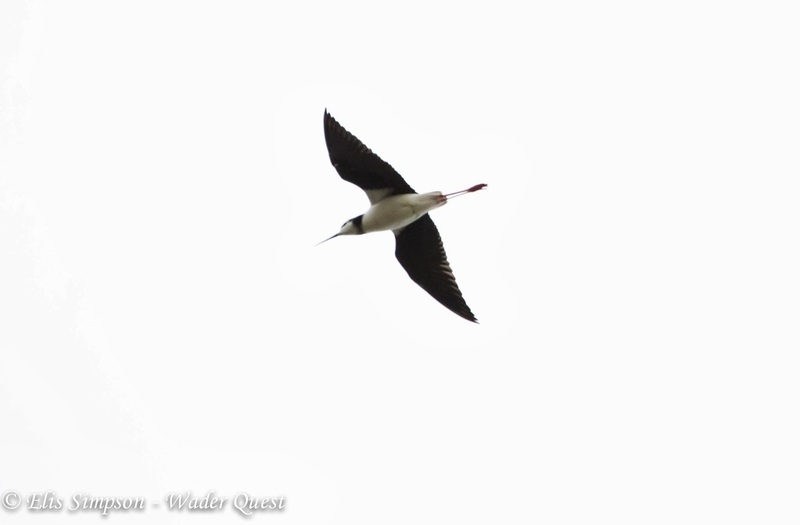 It is slightly confusing as it is less white-headed than Black-winged Stilt! 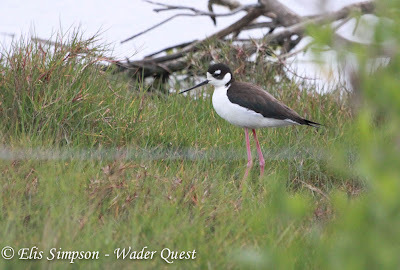 Suerficially very similar to the White-backed Stilt of South America, this bird shows a white bar across the shoulder, however the black on the neck is less extenjsive and does not reach the eye. White-headed Stilt Himantopus leucocephalus; Adult, Broome Western Australia, Australia. In New Zealand, Pied Stilts will interbreed with Black Stilts, and this is one of the major problems affecting the survival chances of the latter species. Adult stilt. 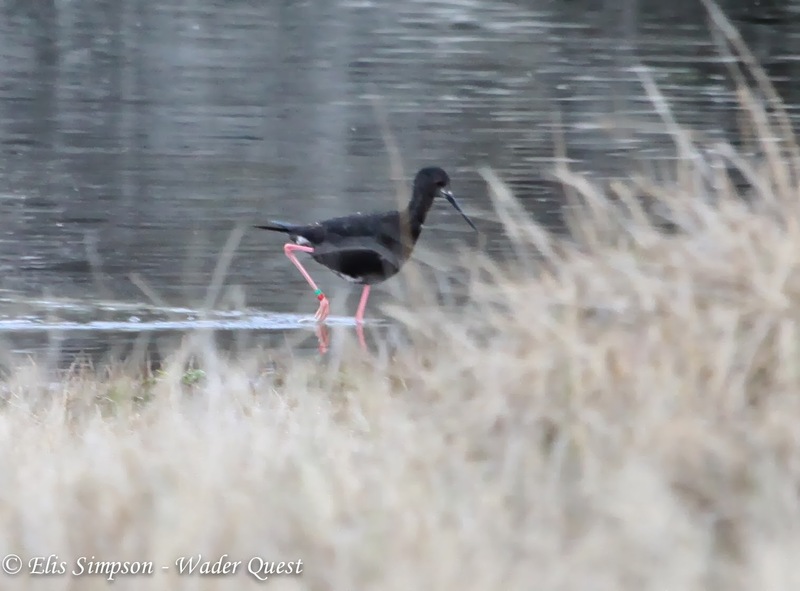 We believe this to be a hybrid White-headed/Black Stilt. Although some male White-headed Stilts in New Zealand show extensive black on the sides of the neck they seldom form a thick black neck-band as in this individual. Here is a copy of the guide used in New Zealand to quantify the degree of hybridisation between the two stilts. We think the bird above is an example of D2 on the chart. 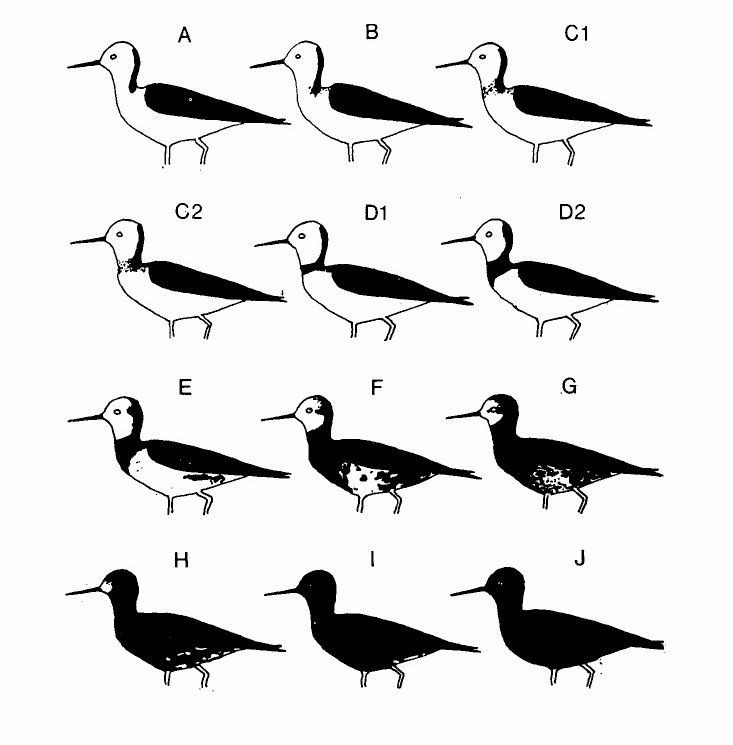 Hybridisation chart between Black Stilt H. novaezelandiae and White-headed Stilt H. leucocephalus. Black Stilt is the rarest wader in the world, there were a little over twenty breeding pairs in 2008 (BirdLife) and although the number of individuals may well have incresed due to intensive management and release of captive bred birds, this number is unlikely to have grown significantly since then. The problem is that when these released bird disperse, unless they happen to find another Black Stilt, they will hybridise with the White-headed thus duluting their gene pool. Adult Black Stilt Himantopus novazelandiae; Glentanner, Canterbury, South Island, New Zealand. The first Black Stilts that we saw Elis managed to get some photos of despite them being very wary. We were a little worried that they may be hybrids as at least one of them showed some white on the undertail, belly and face as in H on the chart above. Our first Black Stilt showing some white feathers. Were these retained juvenile feathers or as it a dreaded hybrid? Lake McGregor, Canterbury, South Island New Zealand. 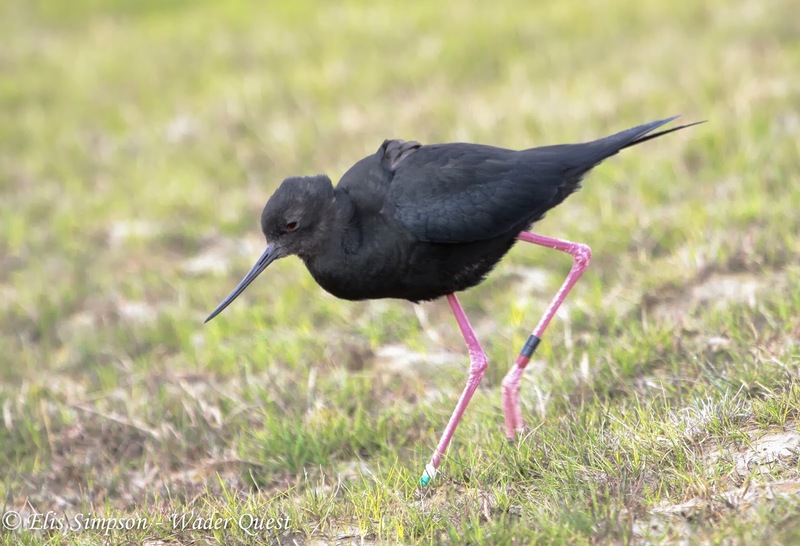 At Glentanner we came acros a lady by the name of Femme, she was part of the release programme and was surrounded by young Black Stilts. We asked her about our bird and she asked to see photographs. 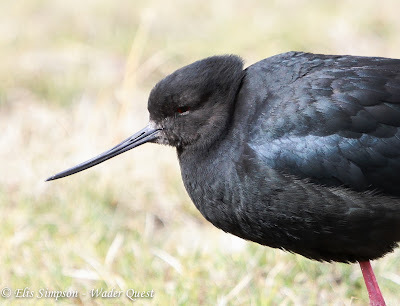 When she came to the photo above she smiled and said that it was definitely 100% Black Stilt as it had colour rings and only these were ringed. Any trace of White-headed Stilt in the blood and the bird does not get ringed. 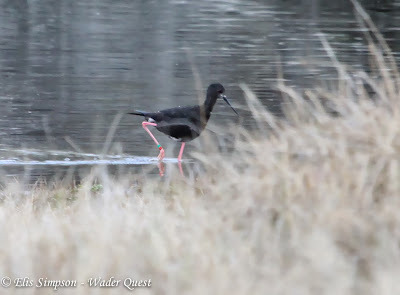 So, we had our Black Stilt, good news. The traces of white were the remains of its juvenile plumage. 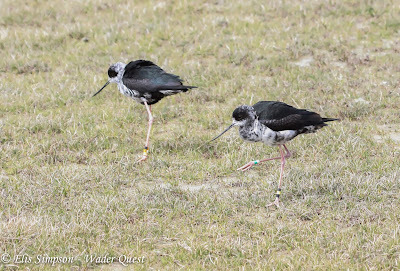 Recently released juvenile Black Stilts. Glentanner, Canterbury, South Island, New Zealand. 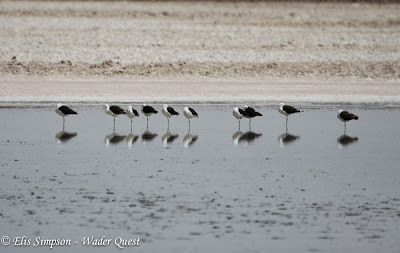 There were a good number of young stilts that Femme was feeding which gave us a good opportunity to study them closely. Juvenile Black Stilt. Glentanner, Canterbury, South Island, New Zealand. Among their number however was an adult. This bird was several years old and had moulted out all its white feathers but unlike the other birds released it did not disperse itself into the surrounding mountain streams; it stayed put. It clearly knew when it was on to a good thing! The adult stilt reluctant to fly the coop. There we are then, a beautiful collection of birds beautifully photographed by Elis. We were especially pleased when we completed the set as it were with Andean Avocet as we had sadly missed that species in Peru giving us anxious times, but all was well in the end. 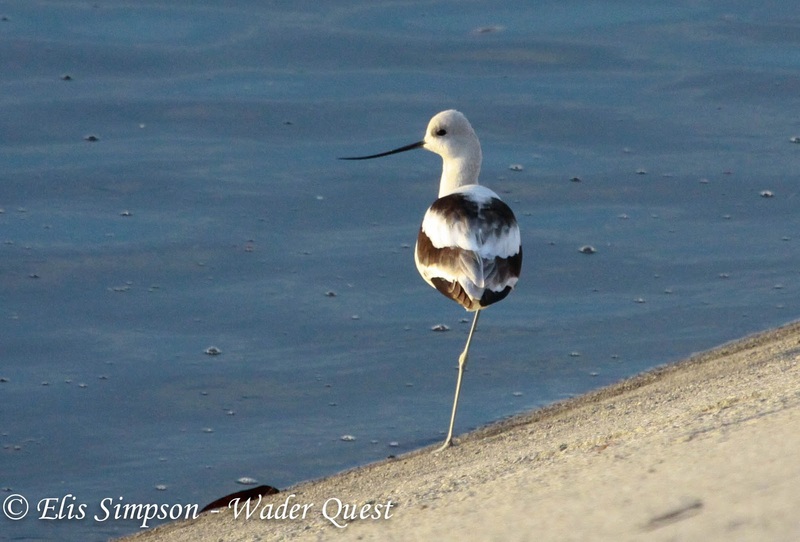 I'm waiting for your book on the world's waders. Not so much an ID guide, more of an appreciation of this special bird family. Great to hear from you, thanks for the kind comment. Find me a publisher and the book is as good as written! Looking forward to seeing you at Martin Mere next week. Cheers my friend.